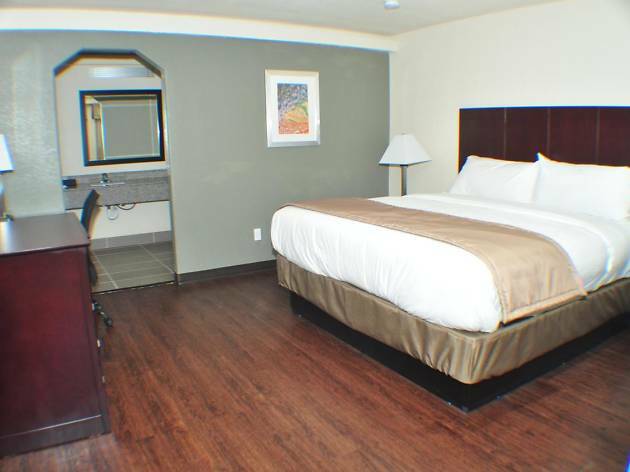 The Trinity Suites Downtown has a superb location one mile from the Dallas Zoo, two miles from Bishop Arts District in Oak Cliff, and three miles from Downtown Dallas, which makes this hotel great for a fun getaway in the Big D.
You can choose between smoking and non-smoking suites with a king size bed. The rooms are equipped with a flat-screen TV, toiletries, free Wi-Fi, an iron, ironing board and air conditioning. 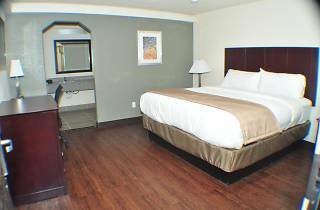 Amenities include free parking, dry cleaning and laundry. Children cannot be accommodated and the hotel has a no pet policy. Public transport to downtown is a short walk away. Don’t miss out on the street art and good dining options in Bishop Arts District. If you’re a history buff, you should visit the Texas Theatre on Jefferson Boulevard. This is where Lee Harvey Oswald was arrested; you can see where he was trying to hide when the police burst in.